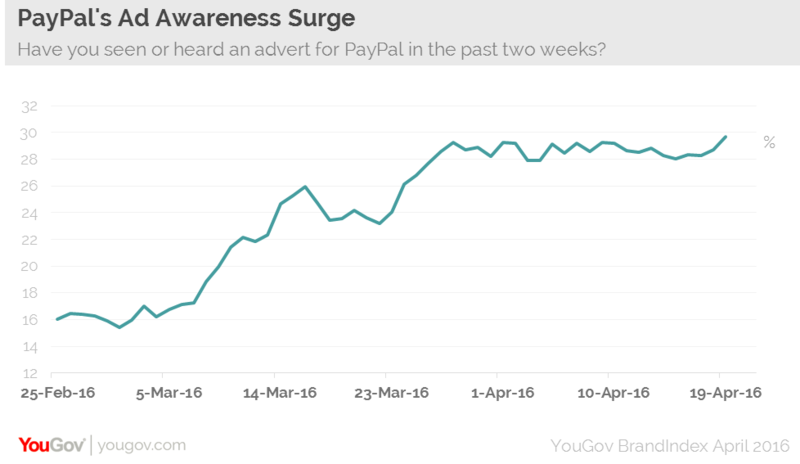 April 26, 2016, 11:37 a.m.
PayPal showed the greatest rise in Ad Awareness last month, according to YouGov BrandIndex data. PayPal&apos;s controversial Christmas advert was the third most complained about advert in 2015. It has moved on with a slicker and more targeted campaign this time around. It&apos;s Ad Awareness score (measured by whether respondents have seen an advertisement within the last 2 weeks) has increased by a 15 percentage points last month, making it the largest rise of any brand over that time. PayPal has employed a carefully targeted approach in London; advertising in tube stations, bus stops and London Underground trains. It seems to have paid off, as evidenced by the success the campaign has had among Londoners. At the beginning of March, compared to any other regions, those living in London reported the lowest levels of Ad Awareness for PayPal. However, by mid-April, Londoners were the most likely to report that they have seen an advertisement for PayPal, as shown by of a significant 20 percentage point increase. Crucially, PayPal figures across other BrandIndex metrics have risen amongst Londoners within the last month – particularly its Purchase Consideration score (whether a respondent would consider purchasing or making use of a product). This has seen a 5 point increase since the beginning of the campaign. The campaign has not only been noticeable, but effective. Whilst Ad Awareness figures have risen for all ages of Londoners, the ‘New Money’ campaign seems to be well received by millennials specifically, with over 40% of this age group reporting they have seen a PayPal ad in the last 2 weeks, rising from only 25% a month ago, indicating that this campaign seems to slowly be winning over the younger audience. The campaign marks an evolution in PayPal’s history. After its break away from eBay, it has battled to imprint itself in consumers’ minds. As attitudes towards mobile payment evolve, it is effectively positioning itself at the forefront of the industry.